Guest Post by Dr. William Hannum. A member of the Science Council for Global Initiatives, Bill worked for more than 40 years in nuclear power development, stretching from design and analysis of the Shippingport reactor to the Integral Fast Reactor. He earned his BA in physics at Princeton and his MS and PhD in nuclear physics at Yale. He has held key management positions with the U. S. Department of Energy (DOE), in reactor physics , reactor safety, and as Deputy Manager of the Idaho Operations Office. He served as Deputy Director General of the OECD Nuclear Energy Agency, Paris, France; Chairman of the TVA Nuclear Safety Review Boards, and Director of the West Valley (high level nuclear waste processing and D&D) Demonstration Project. Dr. Hannum is a fellow of the American Nuclear Society, and has served as a consultant to the National Academy of Engineering on nuclear proliferation issues. He wrote a popular article for Scientific American on smarter use of nuclear waste, which you can download as a PDF here. Fast reactors: nuclear reactors that keep neutrons at high velocities, allowing for breeding of new fissionable material from ‘fertile’ isotopes like Uranium-238. LWR: light-water reactor, the most common form of commercial once-through nuclear power today, where ordinary water acts as a moderator to slow neutrons. MOX: mixed-oxide fuel, a ceramic combination of uranium- and plutonium-oxide, typically fabricated into fuel for LWRs after reprocessing spent nuclear fuel. PYRO: Pyroprocessing, a hot electro-refining method for separating actinides (uranium, plutonium, americium etc.) as a batch from fission products (elements formed when actinides are fissioned). PUREX: Plutonium and Uranium Extraction — an aqueous chemical method for separating pure Plutonium. Pu-239: the most common fissionable (fissile) isotope of plutonium, which is created by neutron bombardment of uranium in a nuclear reactor. U-235: the natural fissile isotope of uranium. For case 2, PUREX facilities to separate the Pu necessary for recycle as MOX fuel are assumed to be available. A fleet of 160 LWRs fueled with U-235 produces enough plutonium to fuel about 40 reactors with recycled Pu. For case 3, FRs are initially fueled with excess weapons material. Additional fast reactors are fueled with material recovered from used LWR fuel. All excess weapons plutonium is used as feedstock for nuclear power. Uranium enrichment facilities that produce the equivalent of 100 T weapons-grade HEU per year. The material actually produced is not weapons-usable, but the enrichment facilities, if repro­grammed, could produce that much weapons material. 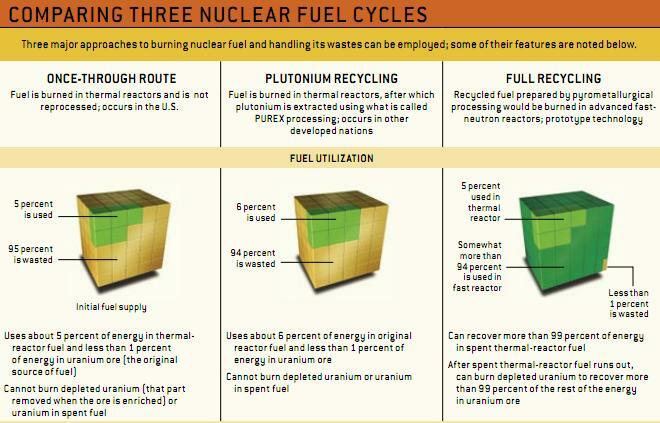 Facilities to manage and dispose of the initial backlog of used LWR fuel plus an annually additional accumulation of used fuel containing 40 T of generally low-grade plutonium. Facilities to manage and dispose of the wastes from the PUREX facility, containing long lived nuclear wastes more toxic than those in the original used LWR fuel; and an annual accumulation of used MOX fuel elements containing 10+ T of generally low-grade plutonium. A facility for recovery of recyclable materials from used LWR fuel; No chemically pure plutonium is involved. Facilities to dispose of the residue from FR recycling, containing essentially no long lived nuclear wastes. The fundamental assumption being made here is that a state that chooses to embark on a weapons program, would chose to attempt to do by producing weapons-grade material with power reactors. In fact the historical record seems to support the idea that rather than go to the trouble, constructing Pu breeders is the preferred route. The second assumption is that somehow an effective mechanism exists that will allow what sort of nuclear technology will be adopted by any given nation can be controlled. Again there is little proof that this is so, and little enthusiasm for the idea outside existing nuclear enabled nations. The fact is that nuclear energy is in and of itself, not a proliferation risk. So far none of the countries “illegally” producing their own nuclear weapons to date have leveraged their nuclear power sectors in any meaningful way. However all of them were driven by extreme geopolitical pressure in their perceived need for a N-weapon capability. The proliferation issue is one of the most enduring hot-button items in the nuclear power debate. There are, I believe, two reasons for this: the first is that there is a self-perpetuating proliferation bureaucracy that needs this problem to justify its own existence, and second, antinuclear forces know well this is an area where nuclear energy’s staunchest supporters will consistently shoot themselves in the foot whenever the topic is brought up. Both of these are acting on the same set of false assumptions that center around the belief that proliferation is a technical problem, that will yield to technical solutions. In fact nothing could be farther from the truth. This perspective is obstreperously held in the face of repeated and consistent evidence from the historical record of the past sixty years that it is invalid. In short: Proliferation is a political, diplomatic, and ultimately a military issue. It has nothing to do at all with nuclear power, or any other nuclear technology. DV82XL, I agree that proliferation is a military not a technology issue. Any nation that operates reactors and has reasonable industrial capacity can use their reactors to irradiate uranium and make plutonium. They almost never choose to do so unless they feel an extreme lack of security (N. Korea done, Iran soon). A large majority of the CO2 emitted in this world comes from nations that already have nuclear weapons (USA, China, India, UK). Developing a prosperous economy with unrestricted trade and travel where nations feel safe and secure is a route to reducing nuclear weapons stockpiles and increasing the nations that gave up nuclear weapons (S. Africa, Belarus, Kazakhstan, Ukraine). Cheap nuclear power will help toward this noble goal. Quick correction: while it’s true that, at present, all fast reactors are build for breeding, that’s largely just because U-238 has a high neutron cross section in the fast spectrum. Thermal reactors can, and do breed new fuel as well. LFTR is a good example, but we need no go farther than the light water reactor, with a breeding rate of 0.6 (i.e., 6 out of every 10 fissions result in the absorption of a neutron by a breedable isotope, specifically, U-238). Fast reactors are easier to build in a breedable configuration, largely because of the higher neutron budget (fast fission reactions produce more neutrons on average than thermal), however, you lose one of the controlling factors for the fission reaction – moderation – and therefore lose an avenue for safety engineering. You’ll note that only two of those reactivity controls are both automatic and tunable. the FP absorption is predictable, but is controlled by the reaction and can produce harmful power cycles if not engineered around. Fast reactors drop moderation as a potential tunable, automatic control. Another disadvantage is that the reactors have to be large. While you get more balanced neutron cross-sections for many fast reactions, and are far more likely to burn not normally fissile trans-actinides with fast fission, the cross sections are still MUCH smaller than their thermal fission equivalents. As a result, you have to give the neutrons a longer runway, as it were, so that they are more likely to result in fission or breeding. My preferred technology for waste and weapon burning is a hybrid LC/LFTR – chloridate the actinides and dissolve them in molten chloride salts for the core, with the standard molten fluoride / ThF4 blanket to breed U-233 for starting LFTRs. This would, of course, have to be a government program, so as to use the military to secure the flow of U-233 away from weapons. This particular case it largely the only true proliferation risk for the LFTR design. There are some significant misconceptions in this blog post. The purpose of IAEA safeguards is to provide timely detection of the diversion of nuclear material from declared nuclear energy facilities. This post says nothing about the technical issues for detecting the diversion of materials from once-through, PUREX, and PYRO systems. The assertion that PYRO is simpler to safeguard than PUREX is unsupported by any analysis or design of a safeguards system for PYRO (none exist as yet), and PYRO is clearly more challenging to safeguard than once-through. This fact does not mean that one should not pursue PYRO rather than once through, but one should be clear that once-through is easier to safeguard (since it is easier to confirm the absence of diversion of fuel assemblies than the absence of diversion of material in a bulk-processing facility). Then there is the risk that a nation might choose to break out from the NPT and pursue weapons. Frankly, here the difference in overall breakout difficulty between having once-through, PUREX, and PYRO is pretty small. Finally, there is the question of detecting the construction of clandestine production facilities. These would likely be clandestine enrichment facilities, given the fact that enrichment facilities have smaller signatures and are more difficult to detect than clandestine reactors and reprocessing facilities. Again, nothing said about this path for proliferation in this post. Thanks,Dr Hannum,for an illuminating article. DV82XL,happy to see you back.Please the ignore the static from the few trolls and assorted ferals on the commentary side of this site. This post is a convenient reference. A very welcome and succinctly written post. Thank you. I do hope that Dr Hannum will play a full and continuing part in the subsequent discussion. The early comments have already raised interesting issues. Podargus – I never left, but I have been ignoring some people as they are not worth my time. Heh, that’s a classic Joe. (emphasis added). This statement jumped out at me – according to my understanding, chemical processing can’t make nuclear materials more radioactive. Or does Dr. Hannum mean that the radioactive materials are more concentrated in the Purex waste stream, hence more toxic per unit mass? IMO critics would jump on a statement like this one, screaming that “recycling makes nuclear waste more toxic!!!!! It says so right here!!! !” without trying to think about it. Can anyone disambiguate this for me? Toxicity II – I’ve realized that the ‘toxicity’ reference could mean chemical toxicity from the reagents required in the PUREX process, and whose products would appear in the waste stream. Disambguation please! I was also wondering about the statement on PUREX toxicity. As well as the ‘more concentrated’ point, there is also the fact that spent MOX fuel contains larger amounts of higher plutonium isotopes Pu-240 and Pu-242, and americium and curium, than once-through spent fuel. Depending on what timescale you look at, this could be more toxic per tonne than once-through spent fuel, but the comparison should be 200 plant-years of once-through spent fuel vs. 40 plant-years of MOX spent fuel + 160 plant-years of PUREX extracted waste. PUREX + MOX recycling is not a good long term option. It’s use on civilian spent fuel was the first stage in a plan to use extracted Pu to start fast reactors, back when it was the only reprocessing system known. Pyroprocessing should do that job better, but no-one has yet invested the money to get it past pilot-plant level, so there is no proof of the economics at full scale. My son has been going to all night “yellow cake” parties, also known as “sunshine cake” throwdowns. He told me they bake all night and sell the cakes to raise money for charity. The kids call it “yellowcaking” and seem to really enjoy it. He has come home in a gas mask a few times. He said it was protection against the flour aerosol. I hope there’s no connection to toping. My son has always stayed out of trouble. There may be a non-chemical possibility for removing fission products from fuel. Crystals which have accumulated defects at one temperature can be smoothed out by baking them at a higher temperature. If the transuranics are alloyed into metal pins, the subsequent fission products might be diffused out of the metal matrix by baking the pins at a higher temperature than they had endured in the reactor. Since FPs accumulate as crystal defects of one third to 2/3 mass, they would diffuse out to the grain boundaries and thence out of the pins. Cleaned, the pins can return to service with their remaining fissionables intact. Although the higher actinides are also crystal defects, they are of similar size and mass to the matrix and thus diffuse much slower. Because they stay diluted in the pins, the policemen have less to worry about. The matrix of used fuel from FRs is likely to be U 238 metal with the main fissionables being Pu 239 and Pu 240 and higher. In subsequent cycles, the U 238 would continue to breed, and the pins would cycle many times. Annealing might take time, as the process cannot exceed the melting point of uranium at 1135° C.
However, the matrix could also be Th 232, (MP 1750°C) with an initial charge of transuranics, perhaps from a PUREX cycle. In this case, the breeding to U 233 might be less efficient, but the transuranics could be accountably burnt away to satisfy policing concerns. Is Dr Hannum inclined to comment? I am disappointed that this thread seems to have stalled. From my perspective, the whole subject of re-processing is of extreme importance, but has received far less attention than comparisons of reactor designs. For nuclear power to be sustainable long term at 20 times its current ouput (an amount that I have learned to be necessary to defeat or avert the consequences of man made climate change and peak oil) some sort of re-processing will obviously become necessary. If one accepts DV82XL’s assertion that proliferation is a political rather than technical issue (which I do) and that reactor accidents in any modern plants are not going to pose any significant risks to the public (which I do), then one is left to consider cost and waste disposal. Given that potentially sustainable beeder or high conversion reactor concepts are, in effect, once through reactors with batch or continuous re-processing to remove nuclear poisons and other fission products and reclaim useful fuel, it obviously becomes highly relevant to consider the pros and cons of the potential competing re-processing arrangements as well as of the reactor designs themselves. I believe that Dr Hannum has provided convincing evidence that the PUREX method, designed with weapons production in mind, has no useful role to play in the renaissance of civil nuclear power. He advocates the PYRO approach and I have no reason to doubt its potential technical advantages over the former method. However, I would greatly appreciate further input from those with appropriate technical knowledge on alternatives to the PYRO approach, such as those developed at Oak Ridge in the MRSE programme. We have had a fair amount of information about IFRs, LFTRS, DMSRs and PB-MSHTRs, including theoretical cost estimates, continuing R&D needs and potential time to deployment, but these have focussed on the reactors rather than on the equally important re-processing aspects. As a layman in these matters, I have been left with the impression the re-processing sides represent trivial concerns relative to the reactor designs themselves and won’t have any serious implications from the regulatory, R&D and cost points of view. Is my impression wrong? Douglas, the PYRO approach is suitable for recycling solid metal fuels. It uses a salt bath as an electrolyte. I am unaware of a better way to reprocess metal fuels. PYRO has been demonstrated at the engineering scale, and indeed the treatment of spent fuel from the EBR-II, continuing to this day, and further proven out various principles. But what is required now is a larger-scale demonstration (a 100t/yr facility). Effective reprocessing is key to the viability of both the IFR and LFTR concepts, and full demonstration of these is essential for commercial deployment of either technology. I will talk more about electro-refining in some future IFR FaD post. Greg Meyerson, when I watched that I thought if I ever catch my kids doing that they are so grounded. But then I realized thats not really fair. I mean, we all experimented with ‘toping when were were at uni. It was just part of the scene. But I worry about the kids today – the stuff’s so much more potent now. In my day it was just natural uranium with just 0.7% U235. But nowadays kids are passing around used CANDU bundles with much higher plutonium content. Some of them are going for designer ‘topes, like U233 and the thorium cycle. I’ve even heard of one kid doing polywell fusion in his garage. If I “just say no”, am I a hypocrite? How do I talk to my kids about ‘toping? Sorry DV82XL – perhaps sacrificing accuracy in an attempt at humour. Did you see the video linked by Joe dirt that this was in reference to? sacrificing accuracy in one area to augment it in another. Considering that a long-range freight aircraft takes off with roughly equal loads of cargo and fuel, a nuclear aircraft would offer plenty of weight savings. No propellant need be carried. As the compression chamber of hot air turbines normally gets a spray of fuel for heating, so the air heats as it flows across the reactor. And if it is remotely piloted and un/loaded, a reactor would not need shielding. Even a crash is less hazardous to a populated landscape as there is no fire. Fuel elements can be identified by their radiation and readily retrieved. The environment benefits, as the aircraft does not leave water vapor for contrails in the stratosphere, and of course, no CO2 waste escapes into the environment. Heck, you wouldn’t want any risk of that! Barry, I hate to tell you this, but your 2009 analysis of CO2 emissions by nuclear capability is grossly simplistic. Just because a country has nuclear power doesn’t mean it can flip a switch and run e.g. its transportation sector on electricity. Home heating lies in between in terms of difficulty. Yes, getting rid of coal-fired power is relatively simple with nuclear energy, but the other sources of carbon aren’t as amenable to quick fixes. It’s time to use a rigorous definition of “toxicity” to avoid any weaselling around the issue. Any consideration of nuclear vs. coal has to look at the sheer quantity of coal ash produced, how toxic it is and how easily it escapes (and floods nearby homes and streams). I’ll let people with more expertise than I do the heavy lifting. And I see Roger Clifton has taken up a meme I tried to develop last month and had to put down due to lack of essential information. That’s something for another day. Engineer-Poet, no need to feel bad in chiding me – I know it is grossly simplistic. The point of that 2009 post was to point out the insincerity of the ‘proliferation concerns’ and carbon emissions mitigation, nothing deeper. A more serious total decarbonization analysis of the system-level problem would of course need to look at electricity, heating, liquid fuels etc. I have recently been doing a high-level analysis of this, which is ongoing and preliminary, in my SNE2060 series, which you can link to as a subheading on the Sustainable Nuclear tab. If it was a simple task, France would have made the full transition. But it hasn’t – it still relies significantly on imported oil for its transportation needs, despite successfully moving to a nuclear-powered electricity grid. The transition to synfuels, electric vehicles etc. will be a challenging one, but the task will increasingly be driven by a range of external pressures beyond just climate change, a point I know you are fully aware of. Thank you for replying to my comments relating to pyroprocessing. While I will look forward to your promised future post on the subject, perhaps I could ask a couple more questions now? 1) The Russians are currently using sodium cooled fast reactors, fuelled with metal oxides. However, they still appear to be very interested in the IFR, metal fuelled PRISM. Is this entirely because of the integrated pyroprocessing feature or are there other advantages for metal over metal oxide fuelling which counter the disadvantage of more waste with the former? 2) Could you give an indication of what sort of conversion might be possible in an AP1000 whose spent fuel is serially subjected to pyroprocessing and topped up with new material as required? The converson figure for an IFR is purportedly in the range of 105-116%. If the equivalent AP1000 range was say, 80-95%, the choice of whether it was sensible to hurry towards breeder reactors would be less dependent upon sustainabiliy than on cost. I believe David LeBlanc has deployed a similar suggestion relating to comparisons between MSCRs and LFTRs. In other words, the decision to move to breeders can be deferred for a few centuries if that decision were to be based upon sustainability alone. This suggests that LCOE should become king. More importantly, It also suggests, as I think you have stated, that we ought to going hell for leather to demonstrate the commercial viability of both pyroprocessing and molten salt fuel reprocessing. Actinide buildup limits recycling of Pu in LWRs. The S-PRISM info I have says that the breeding ratio with top and bottom blankets reaches 1.22. I think the biggest selling point of pyroprocessing LWR fuel as FBR feedstock is that the LWR fuel is a feedstock, not a waste stream. Most of the disposal problem vanishes, including those troublesome actinides. You state that actinide buildup limits recycling of Pu in LWRs. I have no reason to doubt your statement as I lack appropriate technical knowledge. However, in the case of, say, a uranium only DMSR (no thorium), actinides can be recycled and burned off to allow an 80% plus conversion rate. Could you explain why there is this difference between molten salt and solid fuels in words that a layman such as myself could understand? LWR fuel is a precision engineered product, with tight tolerances on the composition and size of the ceramic fuel pellets. Any changes to the fuel require that the new fuel be subjected to extensive testing to prove that it will not suffer undue dammage during its years under heat/pressure/radiation in the reactor core. As increasing quantities of heavy actinides are incorporated into the fuel, each change would require retesting, and the manufacture would become increasingly difficult due to the radioactivity of the heavy actinides. Clean standard fuel can be handled with nothing more than gloves for protection. MOX needs a glove box, viewed though leaded glass. Anything beyond that would need robots, and the whole opperation gets hopelessly uneconomic. An additional problem is that LWRs have poor neutron economy, with lots of losses to fission products and coolant. I don’t think there are enough neutrons to spare to transmute and fission all the actinides, even if you could put them back in. CANDU’s might work, but now you need someone who can do the neutron balance sums properly. Thanks for the info. That puts one cunning little plan to bed and narrows the options.